At the beginning of last month, I set out to write 50,000 words in one month. I’d always wanted to take part in NaNoWriMo (National Novel Writing Month, held in November) before but never had the time. 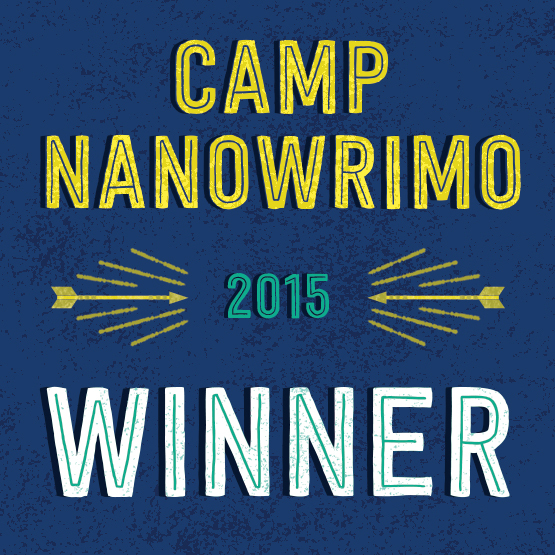 Until I learned about Camp NaNoWriMo, which took place in April and July (I opted for July due to college). So after 31 days, I have 50,038 words and a complete story, Visionary. Here is the working premise: Sometimes, it only takes a dream to wake up. All Hannah Davidson has known is the life of a typical American kid. When she is thrust 2,000 years back in time with no explanation, she must learn how to survive on the streets. She hopes it’s all a dream, but when she finally gets to sleep, Hannah wakes up in yet another life with family members she’s never met. Hannah wonders if she will ever find her way back home, not realizing that her deepest beliefs are about to be tested. Below are just a few of the takeaways from my experience during Camp this July! Day 1: Our building caught fire! Usually, I write a scene with fire somewhere around the middle of the book when I’m stuck. Not at the beginning when the ideas are (semi) flowing. Ironically, a fan started the fire. No, the building did not burn down, and all my books are fine. Day 13: Inspiration. This day was probably the day I wrote the most. I had a cappuccino in the morning, added some music, and wrote 3,000 words. I also took the time to write earlier in the day instead of trying to cram everything in before I went to bed. Day 19: Discovery. As I tried to think of something to record for this day, I realized the opposite themes in the novels I’ve written lately (Visionary and Breaking a Thief). I’d worried that they would be too similar because both protagonists live double lives. This day I realized how they are different. As for the differing themes, well, I’ll leave that up to readers to find out for themselves (I wouldn’t want to give everything away). Day 21: No progress. From July 20-22, the movers came to pack out our house (I don’t post this kind of thing at the time for security purposes). Although I didn’t write anything towards my story the first two days, I found packing to be very inspirational. And by inspirational, I mean boring. It’s amazing how many scene ideas I can come up with as I watch somebody wrap the 50th piece of furniture. Oh, and if velociraptors were still alive, I’m pretty sure they would sound like the tape rollers. Just saying. Day 25: Catching up. This was a productive day, and I even got to relax a little. What’s more, I got to write something that didn’t involve this story, which was a special treat. Sometimes I feel as though writing can be more enjoyable if it’s not mandatory. For example, I come up with the best story ideas when I’m trying to write a paper. It just stands to reason that I can work on one story idea while I've promised to write another. I actually find this can be helpful. If I get tired of one story, I can just switch to the other and work on that one for a while. 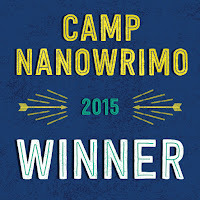 Day 31: Last day of Camp NaNoWriMo. I worked on a bunch of paperwork (4 hours’ worth! Ugh!) and finished my novel. Suffice to say, my post-paperwork writing was perhaps some of the best I’ve written so far because it had a scene with pancakes. Yum! For a full list of my daily reflections, you can check out my Twitter profile here. Being able to write 2,500 words on some days because I have no life. Getting back into writing. For the longest time, I didn’t know which story I should write next. I’m still not sure if Visionary was the right one. But I came to realize that if I never actually decided on one and stuck with it, that I would never get anywhere. So here’s to projects that may not be used but help get writers out of their ruts. My daily Twitter reflections. I stopped journaling every night because I began staying up until 2 a.m. at times, and it usually takes me 30 minutes to journal. The account helped me remember some things throughout this time. Not move/travel in the middle of writing a novel. Seriously though, have you ever tried to pack all your household goods while trying to meet a daily word count? Actually have an outline. In May, I had graduation, then I went on four international vacations, and I finished the second draft for my previous novel. I guess you could say I was too busy to write an outline. That’s not exactly true. I did have time, a little anyway, but I just didn’t use it to give myself the direction I needed. Develop my characters more. This may have also kept characters from randomly popping up, though I’m sure they’d do this anyway. By the end of the story, I had 17 characters with names. My last novel (about 300 pages) had 9. Pretty sure some characters will disappear with revisions. Of course, this story was like many first drafts: fun but rough. It will need revisions, but it was still good to write. Whether or not I will ever return to edit this story is another matter. Next year, I plan to take part in NaNoWriMo again, but I may choose another month due to grad school. Until then, I shall return to editing and plotting outlines. If you have ever participated in NaNoWriMo, what was your experience like? Did you have any insights, funny stories, or excellent lines?